The season of gift-giving is here, and for those of you who practice procrastination, it's time to get to it! After peruising many, many gift guides and coming up short of one that was packed full of items I thought my fabulous friends (or I) would be ecstatic to receive, I knew I had to create one that is purely SugarSpiceStyle. Here are nine gifts for your girls who are your most loved, fun, feminine, and indulgent friends--all under $55. These shot glasses are part of a fun and sinnocent collection of barware by Betsey Johnson; there are also coordinating coasters and drink identifier rings available for purchase separately. We all have a friend who has an extra special appreciation of aesthetics and nature, and this is the perfect gift for that friend! 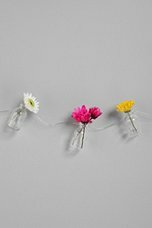 Help her add some life and beauty to her place in a creative way with these whimsical bud vases that string on the wall as if they were lights. Of course, accompanying this gift with a small bouquet of flowers is a must. If you like the idea of a grab-and-go bag as a gift, also take a look at the Boss Lady shopper and the Travel Light overnighter. 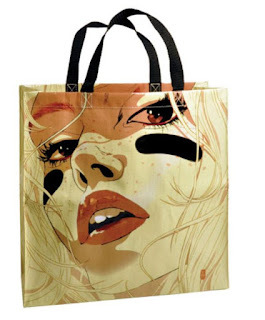 These bags are made of 95% post consumer recycled material. I have a few that I like to use for weekend travel; they're fun to use and strong--perfect for shoes and odds and ends like hair dryers and purses. 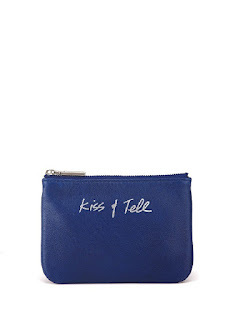 Flasks are not just for men. 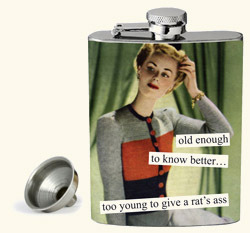 This is 2012, and any sassy party girl should have a flask with a cheeky expression that reflects her personality. 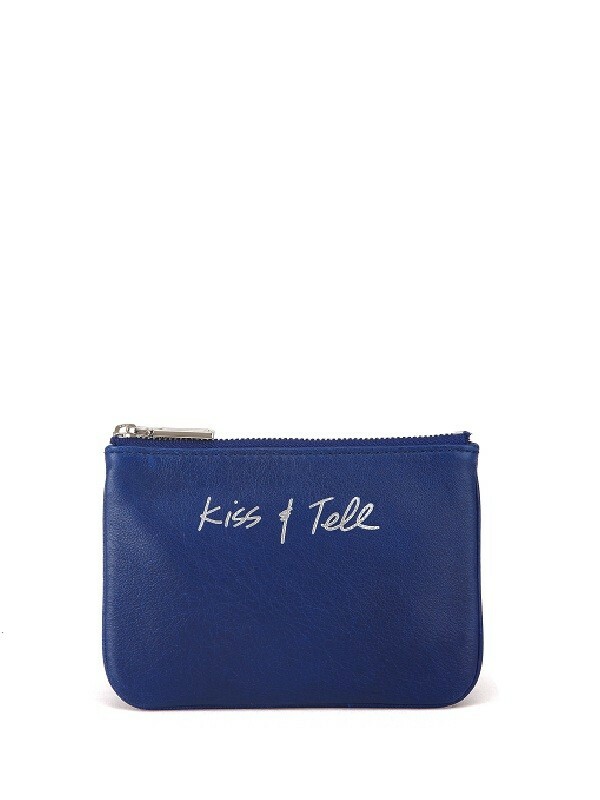 Take a look at Anne Taintor's site for more flasks, cocktail napkins, coasters, and shot glasses with other witty and irreverent phrases. Any friend who likes to nap or travels will appreciate a Mary Green sleep mask. Mary Green is famous for her fine silk lingerie, but her sleep masks are simply the cutest out there. Browse through a selection of dozens of sleep masks with different designs to pick the one that's perfect for your pal. 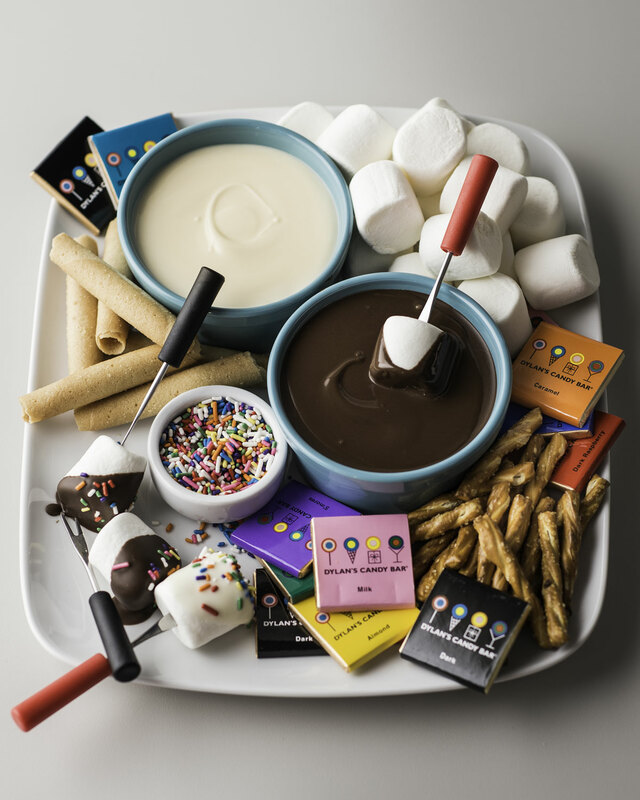 Noone's ever too old to enjoy some sweet messy fun, and this set just screams sleepover, manis, and a catchup sesh! Dylan's always delivers with their treats, and the packaging is just as fun as the goodies inside. 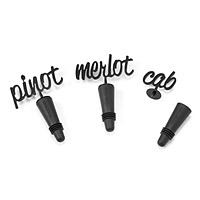 Let your friend add some pizzazz to her wine bottles by gifting a set of these chic wine toppers. They're perfect for your friend who entertains or who is known for her signature glass of wine with dinner. For the girls who have been very good this year (and have plenty of (vicarious) resources), here is a proposed gift list of little luxuries to indulge in every day of the week, throughout the entire year. Prada Candy is my new scent addiction; my vocabulary simply can't do it justice. It is a warm and sweet scent, comprised of caramel, vanilla, and musks. Add to your fragrance collection as well as your boudoir decor with this 30.6 oz more-is-more, exclusive collectible edition of Prada Candy. It's not only quantity but quality that makes this item so special: the bottle's hot pink stripe is Prada's signature saffiano leather, and the black parfum top is made of obsidian. As if that weren't enough, the coordinating presentation case is covered in hot pink saffiano leather, has a small podium inside to display the main event, and is lined in black satin with an embroidered Prada moniker. 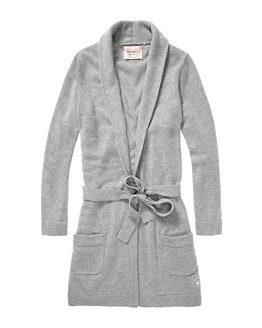 Is there anything softer and more luxurious than draping yourself in pure cashmere after a hot, relaxing bath? For the woman who has it all, this is the perfect addition to her lounging wardrobe. And if she does truly have it all, including a cashmere robe, take a look at Kiki de Montparnasse's lounge apparel for some uber luxe loungewear. 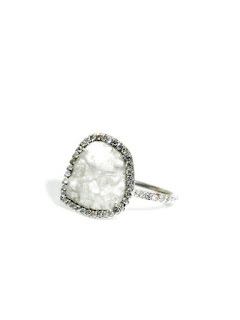 Within the past several years, rough-cut diamonds have become the trend for fine jewelry. A statement cocktail ring is a timeless investment piece that adds an aura to any ensemble, and there are few material goods that rival a left-hand diamond ring, particularly one as unique and fine as this Susan Foster gem. This ring is a gift of a lifetime that she'll treasure forever. Brocade is one of the top trends of Fall/Winter 2012. Showcased by Dolce & Gabanna, Proenza Schouler, and a staple of Balmain, brocade has definitely proven itself as the fashion nectar of the designer gods. Technically, brocade is a type of woven fabric. It's produced on a special loom that gives the appearance that the fabric was embroidered. Jacquard, technically, is used to identify the woven fabrics made on a jacquard loom, which was invented later and made it easier to produce fabrics that look like brocade, damask, etc. Another term you'll see thrown around these parts is baroque, which was a cultural period in Europe during the 17-18th centuries and is defined by its ornate, detailed style. 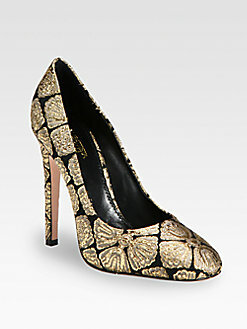 Personally, and apparently Dolce & Gabanna agrees, brocade looks best in black and gold. And what better way to shimmer and shine at a holiday party than with flicks of gilded gold? Below are six statement pieces to work this trend into your wardrobe, a must-have for the fashion conscious. This beautiful bustier has a brocade-type weave and is a gorgeous piece to add some sophistocated fun and flair to your wardrobe. Peplums can be difficult to wear depending on your figure and where the peplum hits. My advice: try it on with bottoms styled similarly to what you'd wear with it, and don't hesitate to ask a friend or your fellow shopper for feedback if you're undecided. Hello tuxedo blazer, love of my life! This blazer is the legitimate deal: genuine brocade. This is an investment piece and probably the smartest purchase of any item featured here. 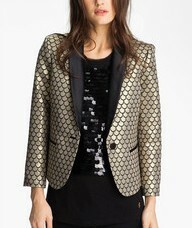 Until December 12th, all Bird by Juicy Couture is 40% off, which brings the palladium brocade blazer down to $179. A special note for wearing brocade: be gentle with it; prong set jewelry can do damage if the weave is large enough. 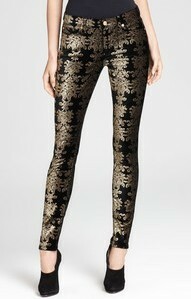 If King Louis XVI were alive, I'm sure he'd have all of his wives dressed up in these gold encrusted velvet skinnies. Not only do these pants suggest an ideal brocade, they also nail the printed pants trend. Extra points! Clearly, sequins are not brocade. However, patterned sequins are a definite showstopper, especially in Victorian print. 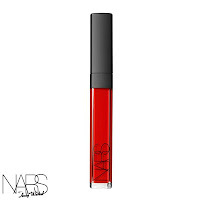 This piece will surely turn heads and garner compliments. Alas! Brocaded couture! These genuine brocaded accessories are great accent pieces for almost any black ensemble, and they go well paired with the above items (exception might be pairing the heels with the pants). These Giambattista Valli pumps are wardrobe royalty. Since the shoes speak for themselves, I will add that if you aren't familiar with Giambattista Valli, you should be. The Parisian design house does dresses and gowns that are nothing short of phenomenal. Haute couture collections 1 and 2 are surely worth viewing, as well as the wedding gowns. A word of caution: wear one brocaded piece at a time or with another small brocade accent piece, such as a clutch or heels. If you should be working as a stylist at Vogue or giving AdR lessons, go ahead and cautiously rock a few brocaded pieces at a time; just make sure the prints are complimentary and the golds work together.